The United States Women’s National Soccer Team is taking on the 2019 Women’s World Cup in style. With their new kits, they are feeling like the reigning champions they are and remembering the champions of ‘99. The amazing group of U.S. women who won the World Cup in 1999 included some of the greatest female soccer players to date: Mia Hamm, Brandi Chastain, Michelle Akers, Julie Foudy, and so many others who became the heroes of many of the women on the USWNT today. 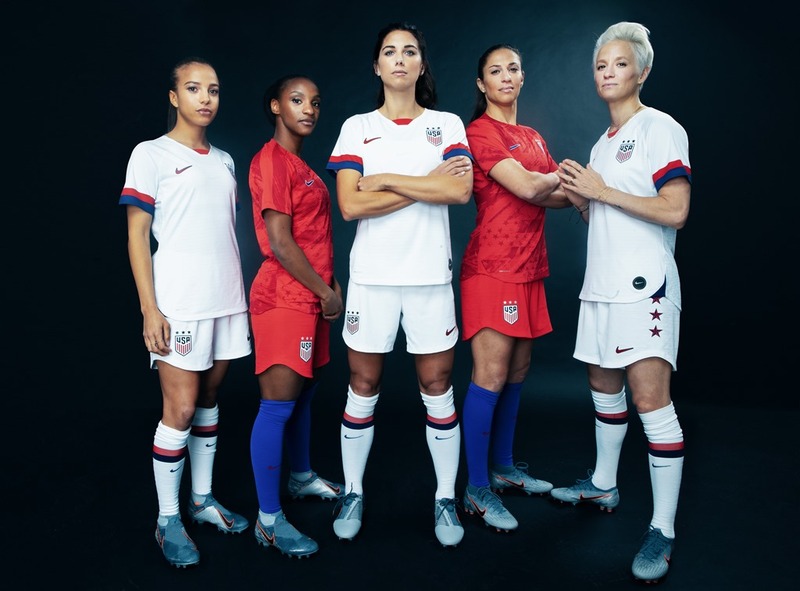 The USWNT of 2019 is honoring the ‘99ers through the design of their brand new Nike kits. The home apparel is white with a red and blue stripe along the sleeve cuff reminiscent of the stripe found on the sleeve cuff of the jerseys of ‘99. On the left side of the chest you will find the USA emblem embellished with the three stars across the top signifying the past World Cup championship wins of 1991, 1999, and 2015. There are also three stars along the left side of the shorts to further honor those wins. A real treat, though, can be found on the back of the Jersey where there is a panel printed with each of the fifty states in light gray. “It is a symbolic reminder of the nation’s support for the team—an enthusiastic ‘We’ve got your back!’” (NIKE). The away gear consists of patriotic red jerseys and shorts paired with blue socks to indicate our American pride. An abstract version of the American flag is incorporated into the design throughout the front of the shirt. Again, the emblem and three stars sits on the left breast of the shirt. The inside of both the home and away jersey reads “One Nation, One Team.” The USWNT also has new training and warm-up gear. The team is showing their country that they are here to honor their heroes and accomplish being the first American team to become back-to-back World Cup Champions. They are ready to fight for their position within the world.